Todays contributions are from: Australia, Austria, Canada, Denmark, France, Germany, Hong Kong, Illinois, Indonesia, Japan, New Hampshire, Pennsylvania, Saudi Arabia, Singapore, Sweden, Texas, United Kingdom, Virginia and Washington. 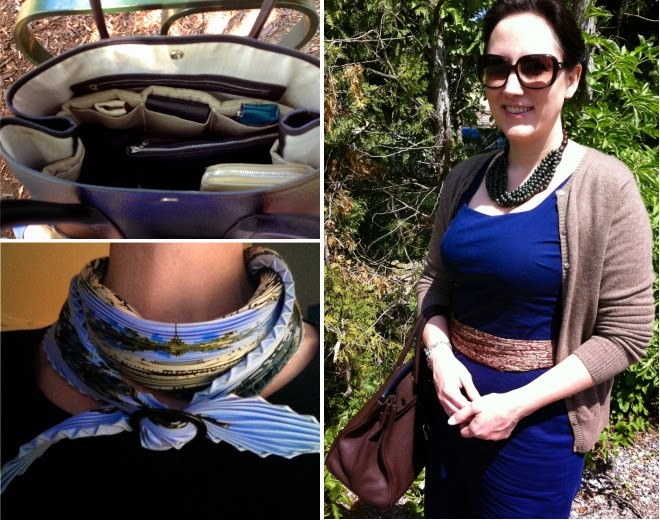 Clockwise from top left: Pam, with a ‘De la mer au ciel’ 90 carré tied into a halter top using a Petite Classique scarf ring. Macs with a 'Brides de Gala' 90 carré worn as a belt, ends secured with a Grande Classique scarf ring in the basic slide. Still-life by Jasmine, with a ‘C’est la fête’ 70 carré, Jige pochette and a Grande Classique scarf ring in light MoP. 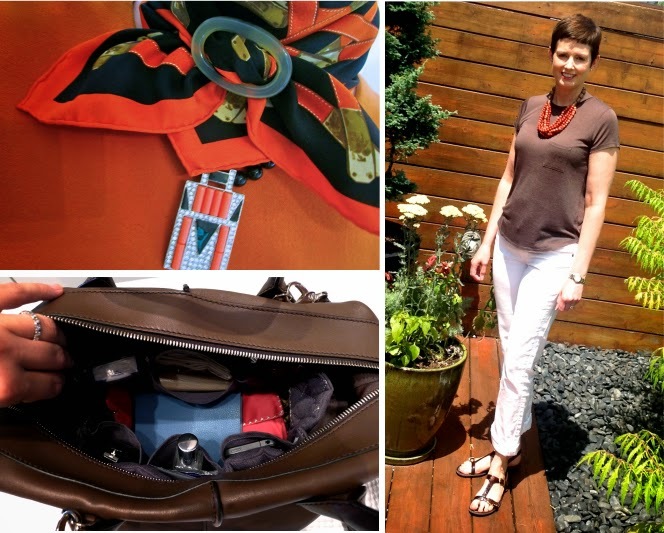 Clockwise from top left: Birgit's Garden Party with a Birkin 35 insert in naturel. Macs with a waterfall necklace in vert olive. Pam with an ‘Astrologie’ plissé, ends secured in the basic slide with a Moyenne Classique scarf ring in black horn. Clockwise from top left: Faux Fuchsia with a 'Printemps-Été 69/Automn Hiver' 70 carré tied with a Classique Moyenne scarf ring in honey in the basic slide. Johanna with a Brazil Maxi Twilly, tied with an Anneau Infinity scarf ring in black horn into a looped cross-slide. Faux Fuchsia as before. Manuela with a 'Charmes des plages Normandes' cotton carré, tied in a criss-cross knot with a Moyenne Classique MoP scarf ring. Clockwise from top left: Cecilia with a 'Le Bal Masque' 70 carré, tied in a slip knot with an Anneau Infinity scarf ring in black horn. As before, but with the scarf folded into a rectangular stripe, and secured in the basic slide with a sunshine honey shawl ring. As before, with scarf worn in a Cowboy knot, with the ends secured in the basic slide with a Petite Classique scarf ring in african horn. Manuela with a 'Monsieur et Madame II' 90 carré as a belt, tied in a basic slide with a Grande Classique scarf ring in light MoP. From left to right: Anne with a 'Poste et Cavalerie' 90 carré in a twist wrap, secured with a Grande Classique scarf ring in Mother of Pearl. Still-life by Jasmine, with a ‘Mythiques Phoenix’ Pareo, a linen carré pochette in taupe, a shawl ring in black with sunshine and a Moyenne Classique scarf ring in honey. 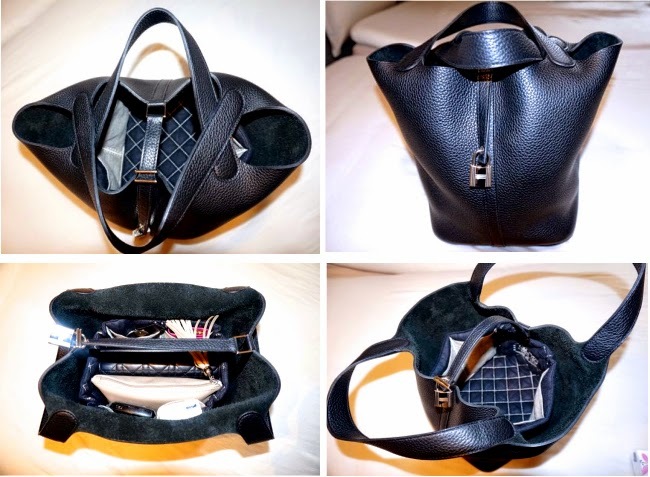 Macs with a Birkin35 insert in a Tod’s D bag. Clockwise from top left: Claudia with a 90 carré worn as belt, secured in the basic slide with a Moyenne Classique scarf ring in light honey. Faux Fuchsia with a 'Très Kelly' 70 carré in a cowboy knot with a Moyenne Classique scarf ring in honey. 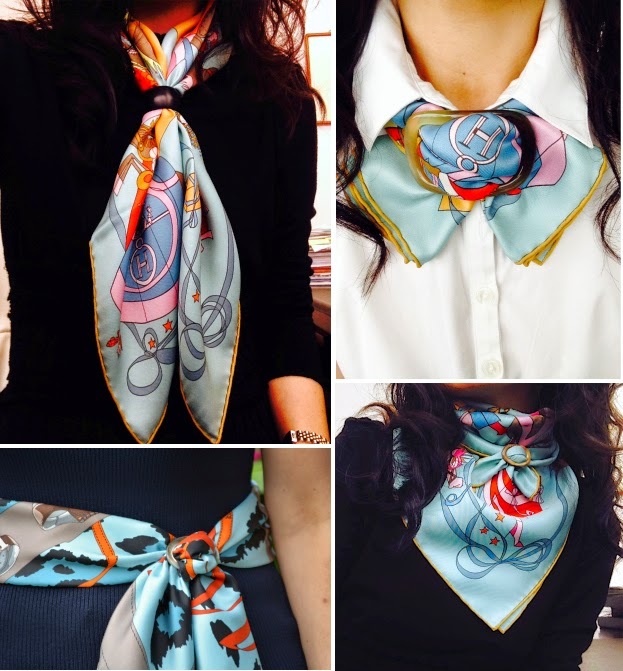 Perla with a Ferragamo pocket square, tied into into a criss-cross bow knot with a Moyenne Classique scarf ring. Blighty with a Gavroche tied in the basic slide with a Moyenne Classique scarf ring in Mother of Pearl. 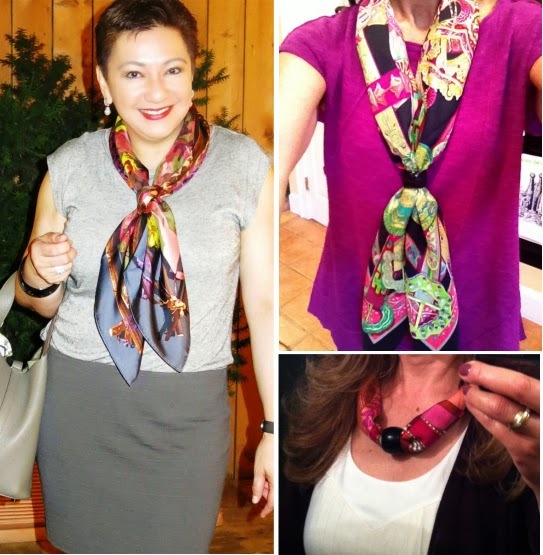 Clockwise from top left: Johanna with a 'Robinson Chic' 90 carré, tied into a criss-cross knot with a Grande scarf ring. Anne with a 'Le Songe de la Licorne' 90 carré, tied into a slip knot with an Anneau Infinity scarf ring in black horn. 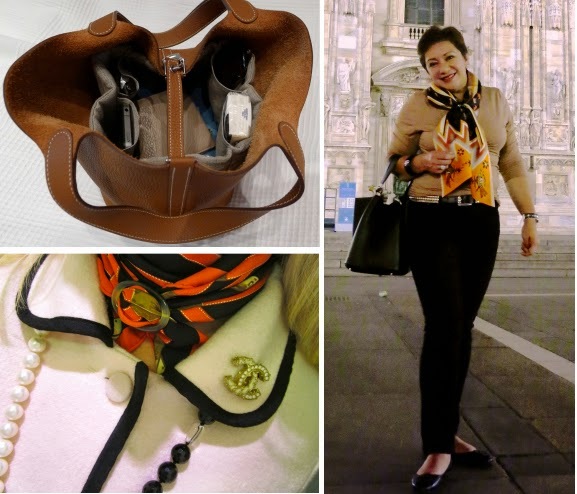 Manuela with 'Coupons Indiens' 90 carré as a necklace, secured with an Anneau Infinity scarf ring in black horn. Clockwise from top left: Mac's Picotin MM/22 in gold with a Picotin MM/22 insert in naturel. Johanna with a 'Kashinas' Maxi Twilly, tied with an Anneau Infinity scarf ring in black horn into a looped cross-slide. Faux Fuchsia with a 'Très Kelly' 70 carré in a cowboy knot with a Moyenne Classique scarf ring in honey. Clockwise from top left: Faux Fuchsia with a 'Très Kelly' 70 carré in a cowboy knot with a Moyenne Classique scarf ring in honey. Carol with a waterfall necklace in brique/saumon. Macs' Tod's D bag with a Birkin35 insert in aubergine. Clockwise from top left: Fifi with a ‘Colliers de Chiens’ 90 carré, tied in a Cowboy Knot with a black horn Grande Classique scarf ring in the basic slide. Anne with a 'Monsieur et Madame' Gavroche, tied into a basic slide with a Moyenne Classique scarf ring in black horn. Macs with a waterfall necklace in olive. Perla with a Ferragamo pocket square, tied into a criss-cross bow knot with a Moyenne Classique scarf ring. Clockwise from top left: Anne with a black waterfall necklace, and a 'Brazil' 90 carré tied into a drape knot with two Grande Classique scarf rings in honey horn. 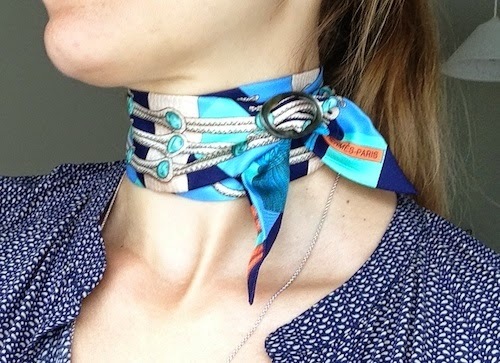 Pam with a ‘Les flots du cheval’ mousseline GM tied in a vertical basic slide with a shawl ring in translucent horn. Monika with a ‘Grand Fonds’ 90 carré tied in the basic slide with a Moyenne Classique scarf ring in regular Mother of Pearl. Irina with a Gavroche, tied in the basic slide with a Petite Classique scarf ring in Mother of Pearl. Irina with a 'Brandebourgs' Twilly, secured in the basic slide with a Petite Classique scarf ring in Mother of Pearl. 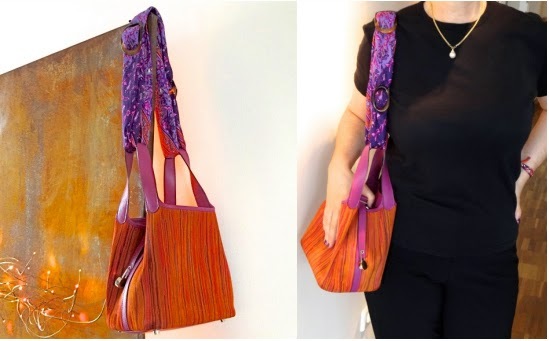 Clockwise from left: Still-life by Johanna: left column: Scarf travel pochette in Rayons, lavender sachet in rose, waterfall necklaces in black, indigo, aqua and desert. 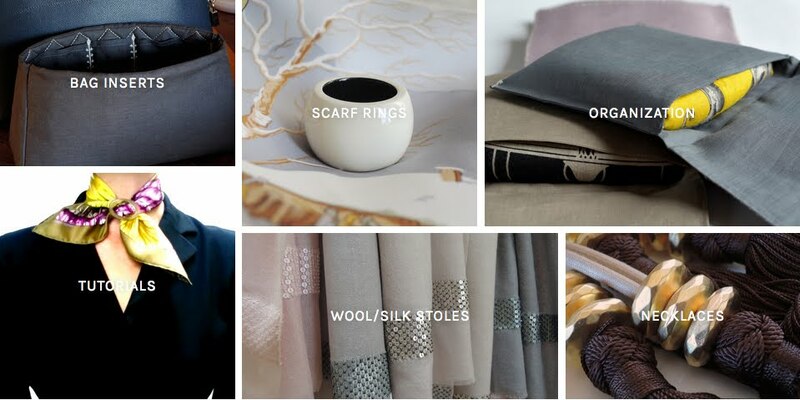 Right column: Linen carré pochettes in gris, lilac and rose, scarf travel pochette in Pétales, Classique scarf rings in Grande and Moyenne. Manuela with a 90 carré in a criss-cross knot. Sheila Knight with a ‘Voyage en etoffes’ 90 carré, tied with a Grande Classique scarf ring in a criss-cross bow knot. Clockwise from left: Macs with a cotton Carré Pochette in hot pink. Still-life by Isa: Carré pochette in mauve brushed cotton with lavender sachets in taupe and rose, and a Grande Classique scarf ring in light Mother of Pearl. Manuela with a 'Monsieur et Madame II' 90 carré as a belt, tied with a Grande Classique scarf ring in the basic slide. Anyone who would like to participate in collage #13, please send your pictures(s) and a short note with which name/ID/nick-name you would like to be credited with to: maitaicollection@orange.fr Looking forward to your contributions! Lovely collage, truly. But, what got me excited is the new shawl pochette that you kind of sneaked in at the end . . . like we wouldn't notice it! Ha! Well, I did, and I've ordered. This is wonderful, especially since those darn cashmere GM's are so fragile and so expensive. Thanks so much for helping us protect our investments. what a nice surprise to find myself in-between all these lovely ladies! 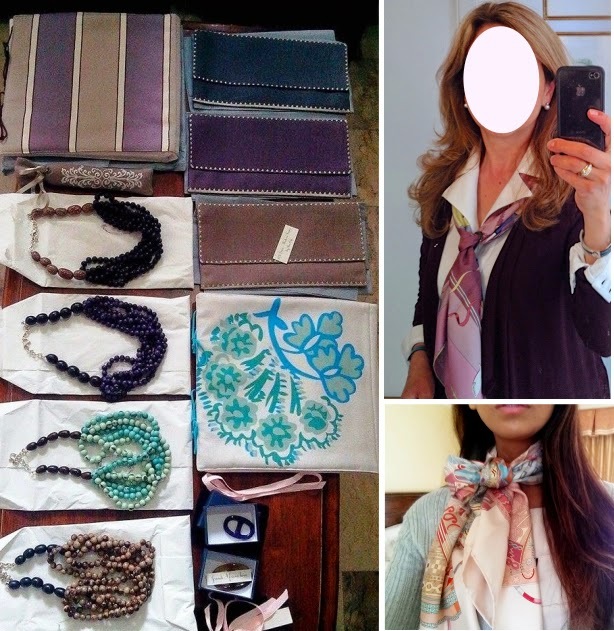 I love these collages, seeing what ideas my fellow scarf loving "sisters" come up with - they impress me every time! Ladies--You are fabulous, one and all! Thank you for sharing your style. And thank you, Mai Tai, for putting this collage together for our viewing pleasure. 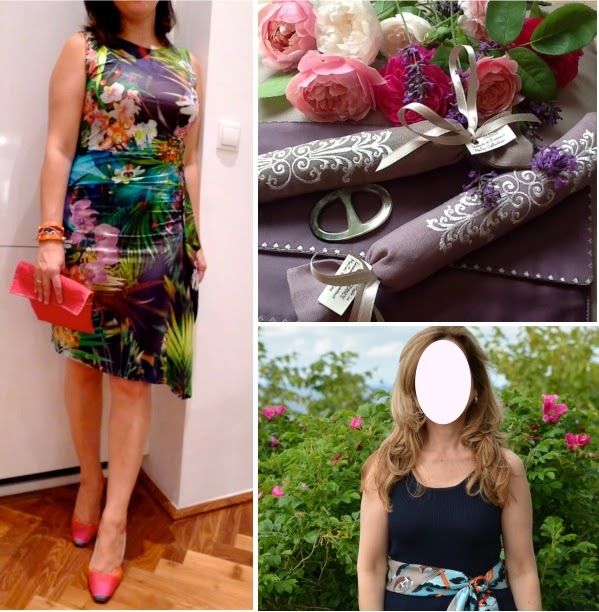 I love these posts so much, thankyou for including me amongst your stylish readers. 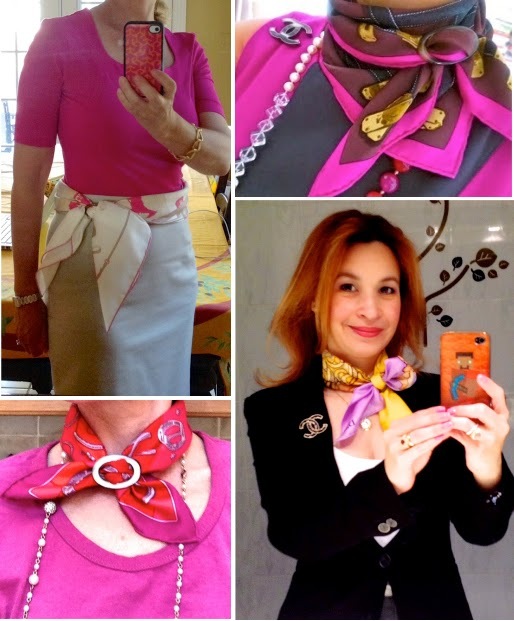 It's always interesting to see real life people from all around the globe wearing their gorgeous scarves. Oh Mai Tai ! All your "ladies" are so lively, class and wear so well your accessories that it's a joy for the eyes. Thanks to make these long collages for us, it's each time a real pleasure. You described the participants so well, many thanks my dear Monica! J 'adore ces collages! cela donne plein d'idées et d'envies de foulards.. Un jour peut être je saurais mettre mes photos sur le site mais je suis nulle dans ce domaine!!! Merci pour le gentil commentaire, chère Véronique. Un jour... j'espère! It would be the first magazine where the models are the readers.. this is pretty cool! My hair even refuses to listen to the hairdresser! What stylish women. I get so inspired! Thanks!! Lovely ladies and collage as always! Beautiful group of brand ambassadors for the MT Collection! Already placed my order the minute it came across the waves...sure to be a hit! Macs, the necklace looks so lovely on you! My first appearance in a collage - I feel like a STAR, dahlinks! 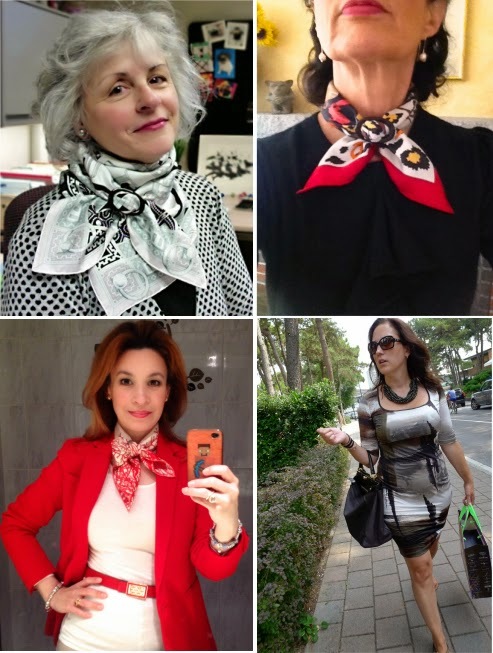 Love seeing how everyone rocks their scarves and accessories. It's inspirational. Thanks, dear MaiTai! Emily, I agree with you that Manuela's hair is always beautiful. I hope you and your wayward hair will be in the next collage! Agree with you and Emily on Manuela's hair! How flattering to be included--a bit embarrassed, honestly! 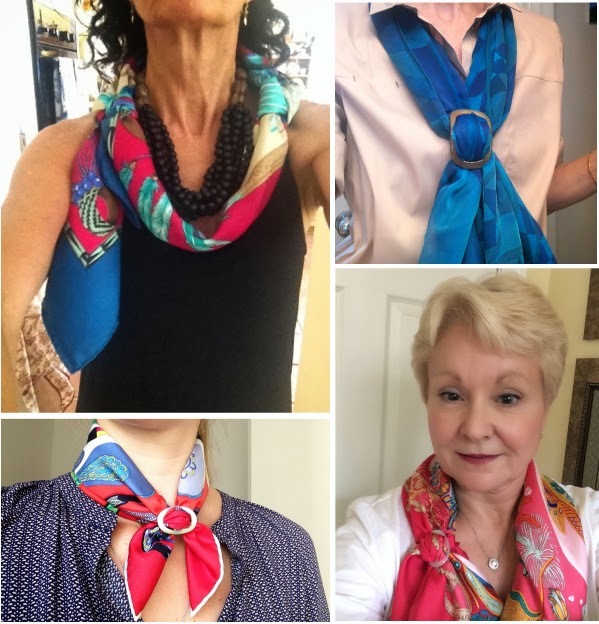 Like others, I love seeing how creative the scarfies around the world are with your wonderful products. Thank you for enabling us! 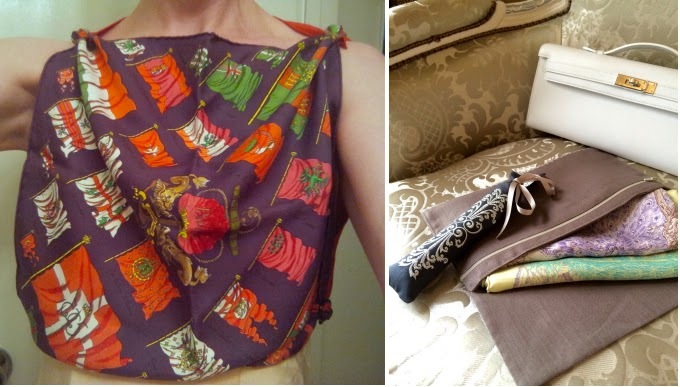 And your shawl pochette will be much more elegant than my ziplock bag. Ha ha, Pam! I use ziplocks too! Time for us both to step it up a notch, yes? I'm the one who is flattered, thanks so much again for the beautiful pictures and fabulous ideas, dear Pam! These ladies look amazing! Truly inspirational. Would you know if 'Le Bal Masque' 70 is stil available. They are my favourite colours. 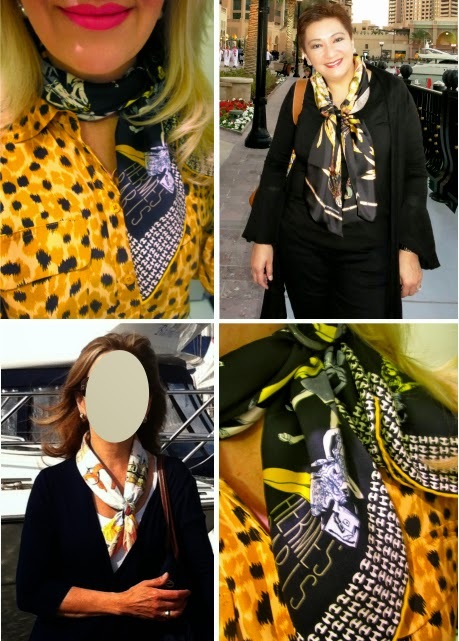 Yes, it's still available online (in five CWs, including the one modelled by Cecilia above): http://uk.hermes.com/la-maison-des-carres/carre-vintage-100-soie-70cm-le-bal-masque-10-63169.html Good luck! Dearest MaiTai, I just love your collage. 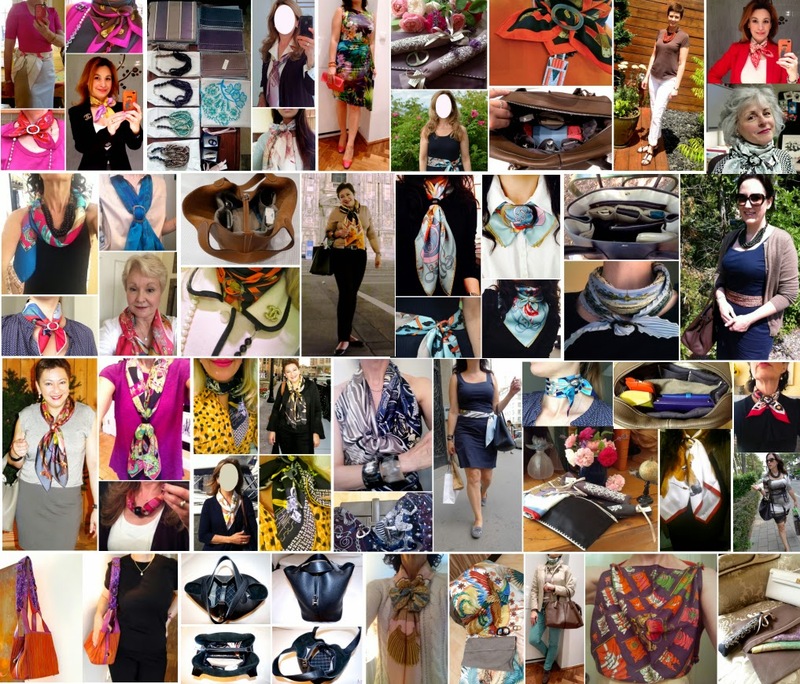 So inspiring with all these beautiful, stylish women showing your wonderful collection! I love these posts too... so many great ideas and such inspiration! Wow, models of the MaiTai Collection Collage #12! 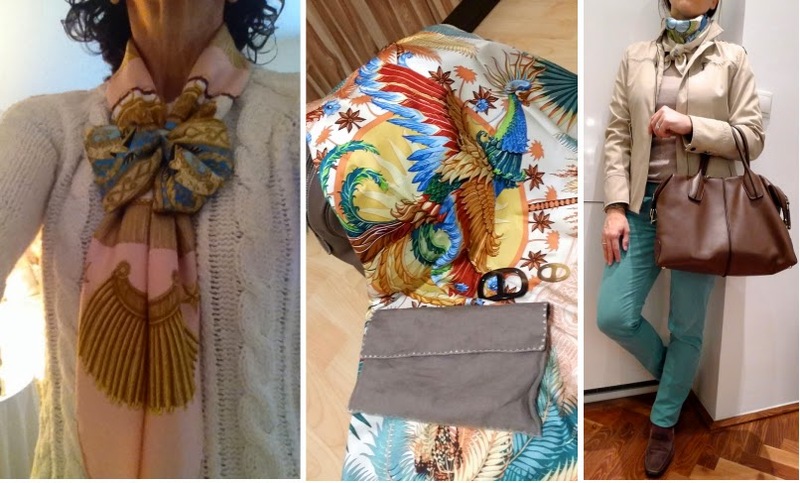 You all look so chic w/ your accessories, and love how you've all used MaiTaiCollection pieces in slightly different and creative ways--thank you for sharing! And, of course, to you, dearest MaiTai, for making your creations possible--just look at the glowing smiles of all the models in your collage: it says everything that words cannot say. Thank you for sharing and ladies, keep on glowing! Oh, my heavens, it is mind boggling fabulous! Thank you for the great show. 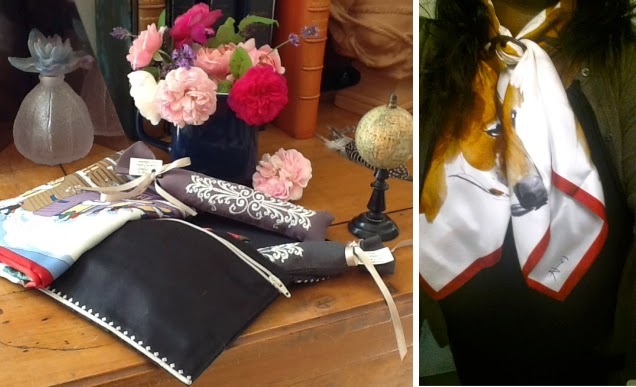 Please tell all the 'girls' that they look gorgeous and have shown such talent and creativity in the way that they have put together their ensembles with the help of you and hermes! It is simply mouth watering. I'm sure the girls loved your comment, thanks so much, dear Happy! Lovely collage - Jasmine I commend your choice of a Victoria II - imho perfection! Dear ladies, you are all glowing and look fabulously. If I could add my tiniest grain of salt regarding the MaiTai collection - as already written in the comments, it are fabulous items. Smiled at the ziplock solution (oh, I used a simple plastic bag for freezer, which is even less in line with H scarves) - never more, I cannot imagine that habit coming back again. 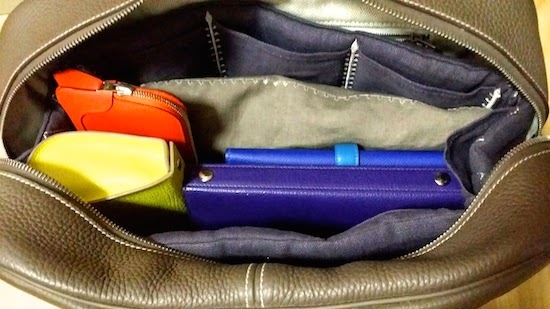 A pochette is an elegant and H-worthy solution and I believe the new GM pochette will follow the same route. You all look absolutely luminous in all of your treasures! Of course, we can all thank our dearest Mai Tai for teaching us how to tie our scarves in such versatile ways. Every time I see these wonderful collages I say to myself , "Next time I'll send in photos". This time I mean it! Cheers to all you lovely ladies! Yes, please do send in your photos! It's so fun and a wonderful way to get to know each other a little. I love that we come from all over the world and meet here, thanks to MaiTai! Dearest Fifi, It's a promise! So happy to see all your postings! Looks like you had a great holiday. I'm unable to take a long trip this summer due to work so seeing your postcards was like having a holiday in the mind. To think that this time last year I was having so much fun in Provence. So thank you for all the visual treats! Your postings are always a nice read on my work trips. Your collage is so inspiring; everyone looked so lovely here! I'm just laughing in delight about all the comments. To think that there's a little girl in everyone of us. When we were young, we dressed up dolls; and then we dress our daughters but we never forget dressing up us! Ladies, keep inspiring! Do enjoy the rest of your summer. I'll be busy planning my autumn wardrobe with your furs. LOL! !